Netflix has cracked the 50-million mark. The streaming video service said Monday that it now boasts over 50 million members in 40 countries, including 36 million in the United States. That compares with 56 million U.S. households that had premium cable subscriptions of some kind as of July, according to Nielsen. Netflix (NFLX) growth slowed a bit in the second quarter, with the company adding just 570,000 U.S. streaming subscribers. That compares with 630,000 in the same quarter a year ago and 2.25 million in the first quarter. In May, Netflix raised subscription prices for new members by $1, though the company said this change had "minimal impact on membership growth." 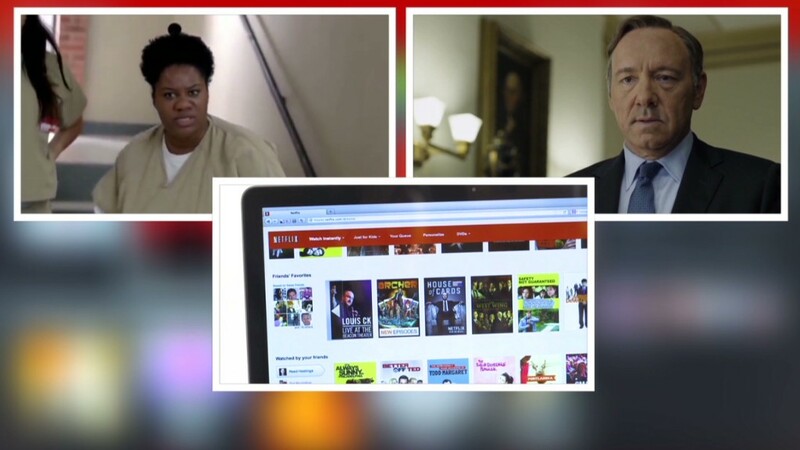 Netflix is continuing its push into original programming with shows like Orange Is The New Black, which launched its second season in early June, and Hemlock Grove, which premiered earlier this month. The fourth and final season of The Killing is due August 1. Netflix shows garnered 31 Emmy nominations this past year. The company said it currently has a number of new shows in production, including Marvel's Daredevil, a partnership with Marvel Television. There's also Sense8, a new show from Matrix directors the Wachowski brothers, and an unnamed thriller from the creators of Damages featuring Kyle Chandler and Sissy Spacek. Netflix turned heads last month with its announcement that it will produce a talk show featuring comedienne Chelsea Handler, a departure from the less topical, scripted content on which the company has focused so far. Speaking to analysts Monday afternoon, Netflix chief content officer Ted Sarandos this decision was driven in part by a change in viewing habits among talk show fans. "They're not watching them at 11:30 -- they're watching them days, weeks, sometimes months later online," Sarandos said. "What we're hoping to do with Chelsea and her team is create a show that's built closer to the way people are going to watch it." Netflix's revenue has been growing steadily in recent quarters, cracking $1 billion for the first time last year and hitting $1.3 billion in the second quarter. That was in line with analyst estimates, and the stock rose slightly in after-hours trading Monday. Moving forward, Netflix is looking to strengthen its European presence, launching this September in Germany, France, Austria, Switzerland, Belgium, and Luxembourg. "There's nothing really different about our international businesses [such] that we can't achieve U.S.-like margins or better," Netflix chief financial officer David Wells said. And for those of you who prefer doing your movie-watching online and but your shopping in person, Netflix announced that it will begin selling gift cards in retail stores later this year.